There are many factors involved when choosing a diamond and an expert diamond buyer will take into account a whole range of measurements and specifications when making his or her choice. For most people; people who are not expert at buying and selecting diamonds, the assessment of a diamond comes down to four things only. These four factors are widely known as "The Four C's". In this section, we will just look at the "Cut" of the diamond. A diamond's cut unleashes its sparkle! 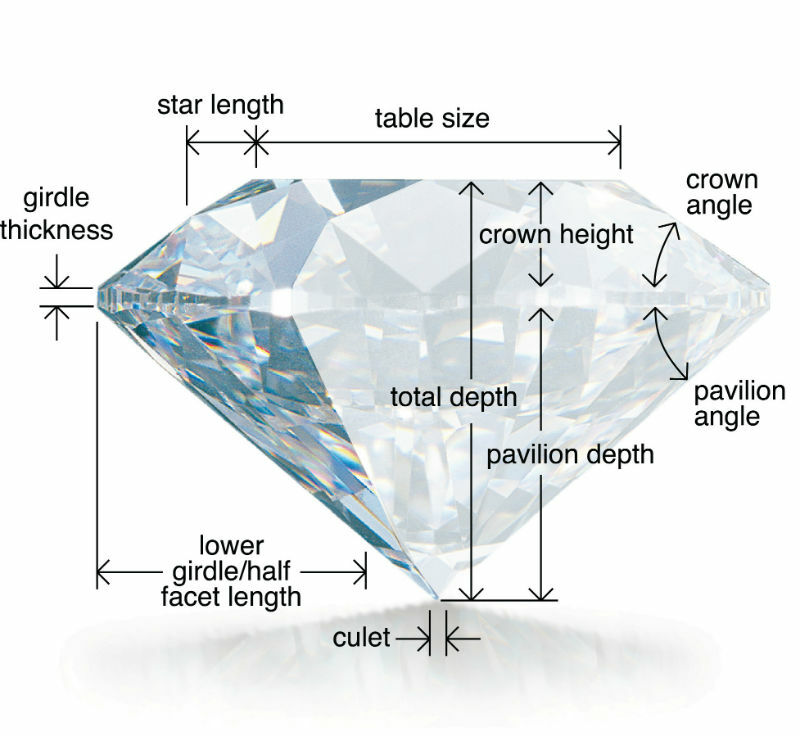 The cut if often confused for the shape of a diamond, whereas it actually refers to its symmetry, polish and proportions - the things that have a huge impact on the sparkle-factor of the diamond. The distance from the bottom of the girdle to the cutlet is called the Pavilion. A diamond with either a shallow or deep pavilion will struggle to produce exceptional sparkle as the light will either escape out the side of leak out the bottom of the diamond. But, it is not just the pavilion that is important when it comes to "cut". If the diamond has poor symmetry, then that also affects the refraction of light and ultimately the brilliance and sparkle of the diamond. These are all the things a good jeweller will be looking at when he or she is assessing or choosing a diamond for you. Balance, symmetry, polish, facets...they are all important in their own, unique way to the overall impact and beauty of a diamond. They all have a direct relationship with how the diamond interacts with light and therefore, the diamond's resulting brilliance, fire and scintillation and that is even before we start thinking about the other three C's!